Four Vitamin B Rich Foods for Hair Growth! We all want to look our best. So dull, brittle hair can be a real problem. It can also be the sign of a bigger problem, like a vitamin B complex deficiency. What if there was a simple and delicious solution? Getting enough of the right kinds of B vitamins provides your body with the tools it needs to create fast-growing, radiant hair. It’s important to know there are several kinds of B vitamins, and they are all essential for your well-being. Take a look at these four healthy foods loaded with B vitamins and other nutrients that support healthy, beautiful hair. Plenty of protein is also required for strong hair, and that’s what makes Greek yogurt so great. In addition to healthy animal protein, it’s got vitamin B2 (riboflavin) to help you process the protein and vitamin B5 (pantothenic acid) to promote good scalp circulation. The rich content of B12 is Greek yogurt’s highest claim though, with almost 30% of your daily requirement per serving. This vitamin services the metabolic functions of your body which make hair growth possible, and a vitamin B12 deficiency is associated with premature graying and hair loss. Eggs are some of the most potent foods on the planet, and their combination of key nutrients is perfect for promoting hair growth. Like Greek yogurt, eggs are full of protein and B12. They also contain another important B complex vitamin, B7 (biotin). Biotin has been related to longer, stronger hair and its benefits extend to the skin and nails as well. It doesn’t matter how you cook your eggs, but the most hair-friendly nutrients are in the yolk. Eating a few eggs a week can make your hair stronger and your skin brighter. Another great source of biotin are walnuts, but that’s not all they have to offer. Walnuts are also the most rich nut in omega-3 fatty acids, providing almost an entire daily requirement in ¼ cup. Omega-3s perform numerous body functions, including keeping hair flexible and strong. The amino acid, L-arginine, is also potently found in walnuts. It’s been used in topical hair growth formulas for its restorative effects, and ingested it aids with circulation and blood flow. These nutrients together make walnuts ideal for those interested in improving the health of their scalp and hair. The combination of hair-enriching nutrients found in oysters offers a powerful solution to the types of nutrient deficiencies that ravage hair. Oysters are an incredible source of B12, protein and zinc, and a moderate source of B2 and B6. They provide omega-3 fatty acids, too, making oysters the most beneficial food on the list. The importance of oyster’s outstanding zinc content can’t be overstated. Zinc deficiencies lead quickly to hair loss. Zinc plays many roles, including cell development, hormone balance and enabling other nutrients to be absorbed. All of these things are related to the growth of full, healthy hair, and when eaten together with B complex vitamins can visibly improve hair quality. Oysters provide all these benefits and more. By eating a balanced diet of hair-enriching foods like these, you can give your body the tools to reach its full potential. Don’t be fooled into thinking you need supplements or expensive products to achieve the smooth, shiny hair you deserve; the ingredients to your success are all around you! For a particularly powerful infusion of B vitamins and other essential nutrients for hair health, try a spinach and salmon omelette with a small side of greek yogurt. The iron from the spinach and the healthy fats from the salmon will give a boost to the B vitamins and other building blocks of your new luscious locks! This is a guest post by Rohit Agarwal. He is a foodie, traveller, yoga-doer and tech-freak. He is a reader, writer and health conscious person. He is the current contributor for nicehair.org and likes to write on travel & health. This entry was posted on February 8, 2016, in Beauty, Health! and tagged Beauty blogger, Dandruff, egg yolk, Eggs, Greek Yogurt, hair growth, hair loss, Oysters, Premature greying, Rohit Agarwal, thinning hair, Walnuts. Guest post: Restore health to your hair! 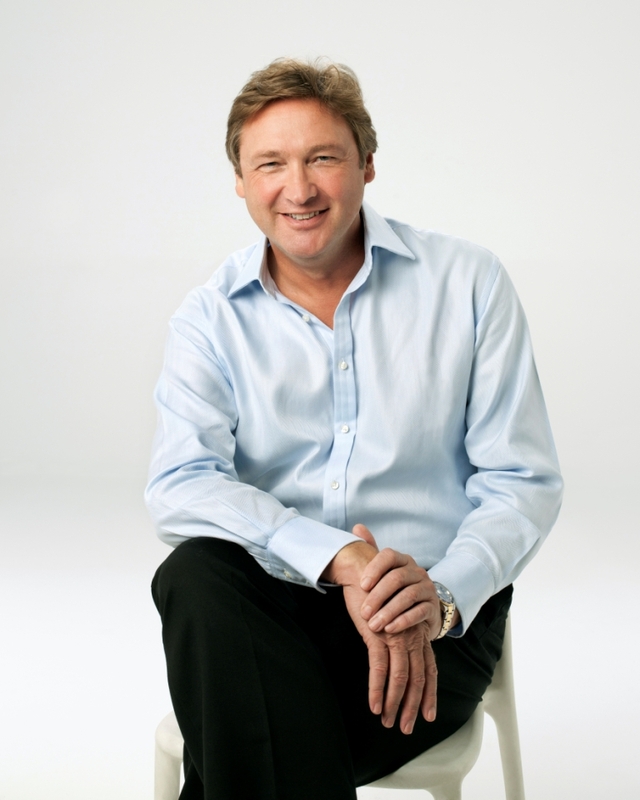 Struggling with hair loss or simply a bad hair day can affect anyone’s sense of confidence. If you decide to take action and do something about your hair loss, here are some tips to guide you through your hair troubles. Start by taking a picture of yourself. This will be like the before and after pictures you see on TV infomercials. Having this picture will help you to see yourself better and to decide how to address your hair problems. Measure the present condition of your hair. Identify what you like and don’t like—whether it’s the color, texture, or style. Figure out what you want to change and what you can improve upon. Determine the most critical issues you need to solve, and set your goals. Begin researching possible solutions for your hair woes. Take advantage of all the free resources available. You can research online, read books and magazines, or ask your friends for their opinion. Decide what you can do to better your look. Would a new color be more flattering? Should you invest in a shampoo that’s more tailored to your hair type? Is blow drying your hair keeping your strands dry and brittle?. You can now create your own routine to solve your specific hair problems. The most common place to start would be to cleanse your hair. Based on your research, you can look for a product that will give you a cleaner feel. Moisturize your hair to keep it healthy and strong. Work on strengthening your hair as it becomes brittle from overuse of styling tools. Protect your hair from further damage by using heat protectant products. Stick to your routine. This process could be very slow, and patience and dedication might be required for you to achieve your hair goals. 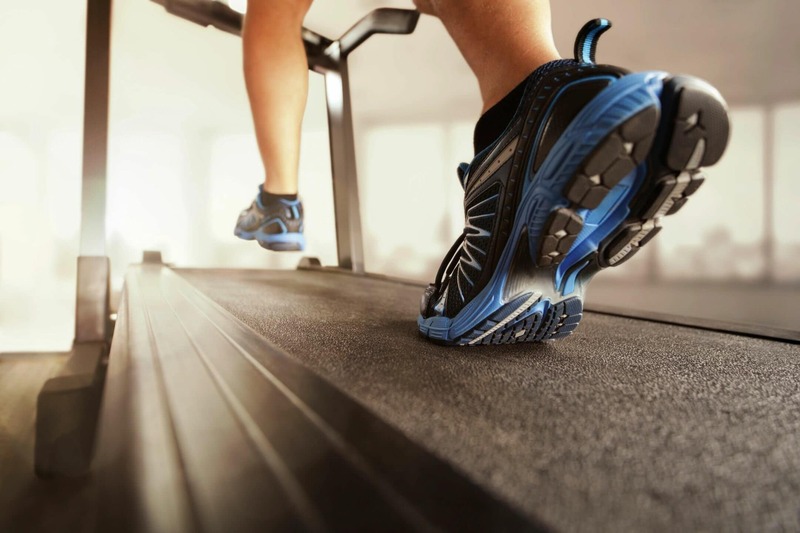 Be consistent, and try not to fall back into counterproductive habits. Checking your progress would be the last step. Check your “before” picture to see if your routine is working. Verify if you have less shedding and/or breakage, etc. Did you achieve your goal? Decide if you want to continue the routine or not. If you have positive results you can either continue the process or start on a new goal. These tips could be very helpful in guiding you to a hair routine that is suited for your specific hair troubles. Remember, good-looking and healthy hair can go a long way in making you feel attractive and self-confident. Of course, it should be noted that if your hair loss condition does not get better and the treatments you’ve tried do not work, you need to explore other solutions. 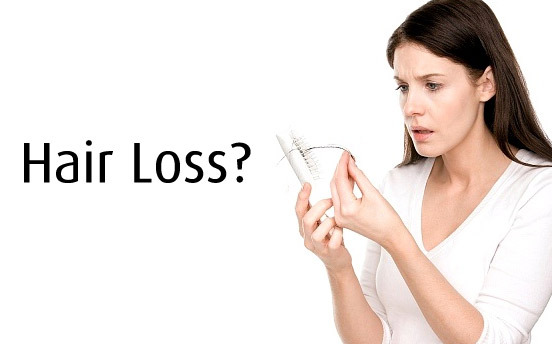 There are some permanent hair loss solutions, such as laser therapy and hair transplantation, that you can check out. Dandruff Debunked: Is There a Connection to Hair Loss? Read on to find out what dandruff really is and whether it’s connected to hair loss, according to Mike Ryan – Trichologist, Brand Expert CLEAR Arabia! Sometimes people wonder if their hair loss is a result of their dandruff. This is a very common myth, and can be a bit tricky to answer for a few reasons. In general, dandruff is not a direct cause of hair loss. However, the scratching associated with dandruff can in fact damage the cuticular scale of your hair shafts. The cuticular scale is a protective covering on each individual hair and, when damaged, can lead to the hair falling out. In most cases, dandruff does not lead to such an amount of scratching, and therefore is probably not the reason for your hair loss. There are a few different causes for dandruff, so there are many reasons that people could have it. Dandruff is mainly cause by a fungus that can be found in the atmosphere and can infect anybody. A few other causes of dandruff are high intakes of sugar and fats, prolonged exposure to sunlight, overuse of hair care products, and some dermatologists even think stress can cause dandruff. If your case of dandruff does result in severe scratching, you may want to look into some treatments for your dandruff itself. If your dandruff is not caused by genetic reasons, it should be easy enough to treat. The best remedy for dandruff is available in over-the-counter shampoos and conditioners as these hair products contain certain chemicals like zinc pyrithione and selenium sulfide that prevent the regrowth of fungus on the scalp. Contrary to popular belief, dandruff is not dry scalp. Most dandruff is oily so there is no point in putting on oil and rubbing it in – it will only make the oily flakes oilier and stickier. Dandruff affects most people at some time in their life, often temporarily and fluctuating. Research indicates that it is stimulated by a micro-organism normally present on everyone’s scalp as part of the skin’s normal flora – so you can’t catch it as you already have it. The skin’s secretions control the organism, keeping it at a certain level. Adverse changes in the secretions, however, enable the micro-organism to flourish and cause the scalp to produce skin flakes faster – which in turn creates the dandruff flakes. The extra rapidity of skin production and an increase in sebum cause the flakes to become oily and stick to the scalp. Reasons for adverse changes in skin secretions can be stress, hormone changes in sexes, diet, cosmetic products and poor hygiene. You guys know what kind of poor diet most of the people have these days. What with amazing, yet calorie laden food easily available, it’s not anyone’s fault that green leafy vegetables and fruits become ‘unattractive’!. So, I would say, vitamin supplements are a must for everyone. Following are the vitamins I take and highly recommend to you too. Before going ahead, please bare in mind that if you take any kind of medicines, it’s always great to consult with your doctor before adding supplements to your daily routine. I take this for overall health. Fish oils are amazing. I am not much of a fish lover, particularly not of sardines, which is a good source of Omega 3 oil. These tablets are an excellent source of Vitamins A & D and help in maintenance of good skin, eyesight and ensure healthy immune system. 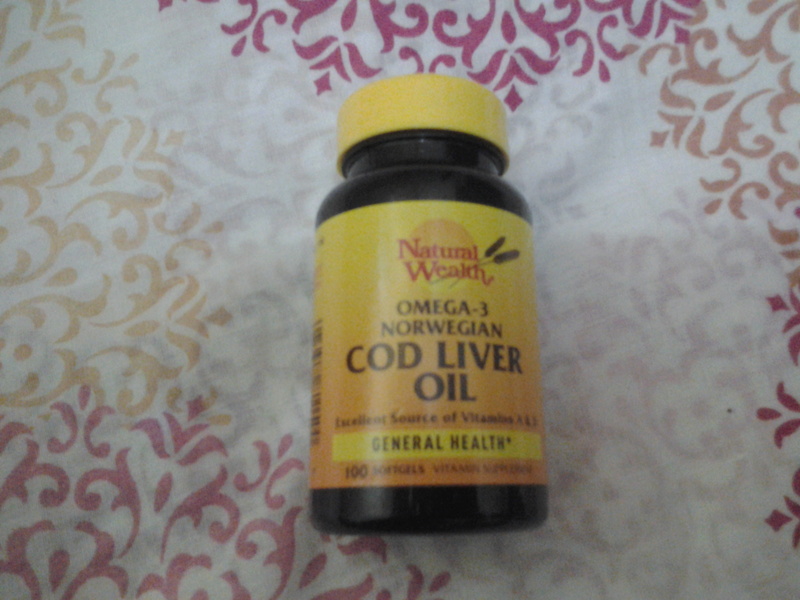 The one that I use is Omega 3 Norwegian Cod Liver Oil tablets from Natural Wealth. A bottle, costing AED 35, contains 100 tablets, which is good for a little more than 3 months because the recommended prescription is 1 tablet per day. 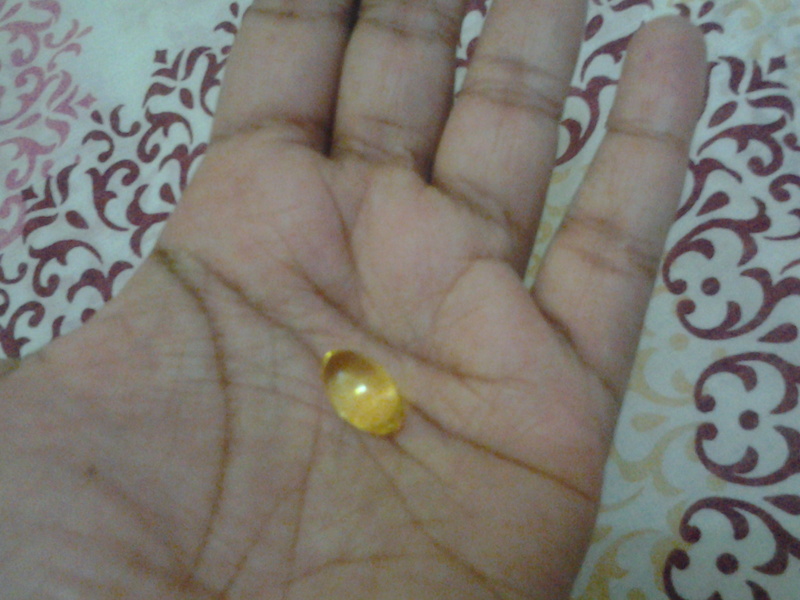 The tablets are oval and golden in color, with a distinct smell which I cant really put my finger on. Pretty weird smell, but I wouldnt consider it bad. If you have never taken these before, lemme warn you not to ever bite this tablet. The gel inside has a pungent fishy smell, that you wont be able to stand! I take this mainly to promote hair growth. I have discussed earlier on this blog about my damaged hair and such. From the haircare DIYs that I do, you probably already know that I am trying my best to restore health and vitality to my crowning glory!. So when I came across Biotin and knew more about it, I knew I had to have it. Biotin is a water soluble B complex vitamin also known as Vitamin H. It helps in cell regeneration, promoting nail and hair health and preventing hairloss. It is available at any pharmacy in varying concentration. 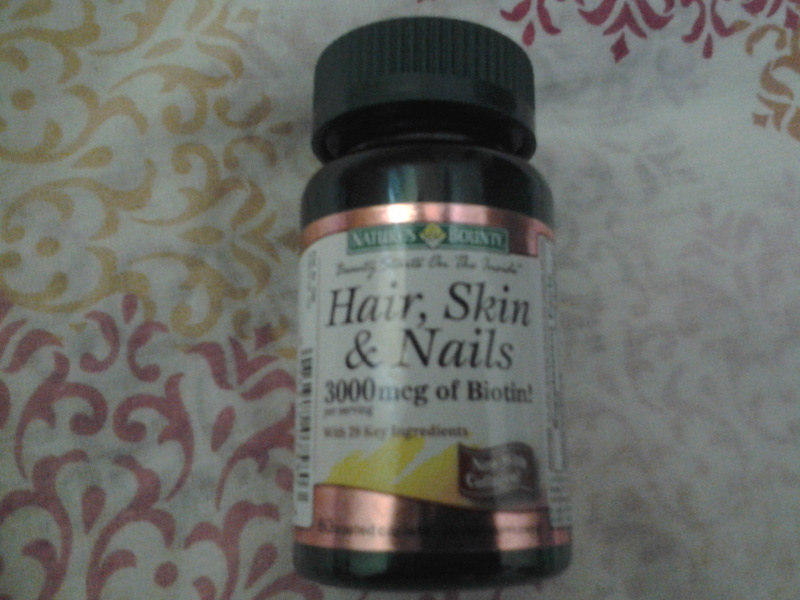 I decided to start with Hair, Skin & Nails tablets from Nature’s Bounty at first. Along with Biotin, these tablets contains other vitamins too like A, C, D, E (well, pretty much every alphabet out there! ), Calcium, Collagen, Iron etc. The biotin level is the highest though being 3000mcg per serving size, which is 3 tablets. 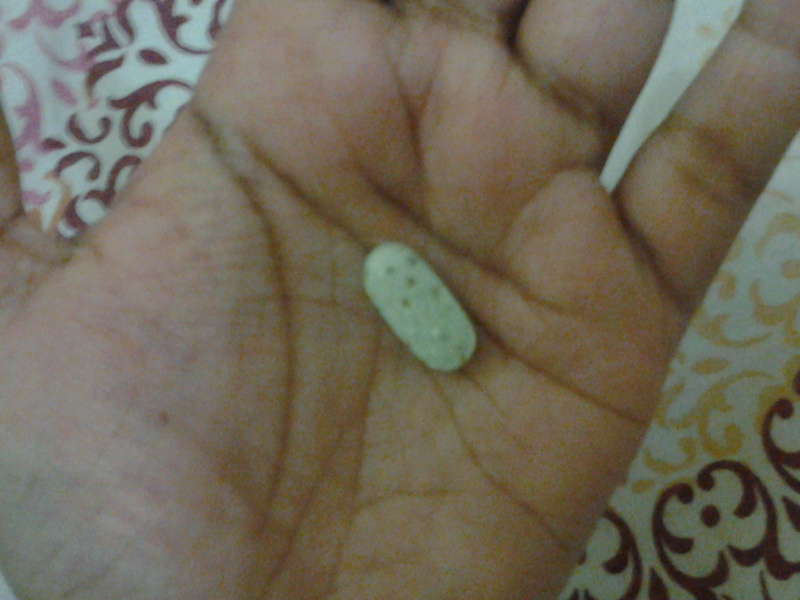 Though it says to take 3 tablets, I took only 1 per day. Let’s do the math, shall we?. So one tablet gave me 1000mcg per day. I think that’s a very decent amount to start with. The tablet has a very pungent smell like yogurt that’s gone bad!. It has a light green color with brownish spots. 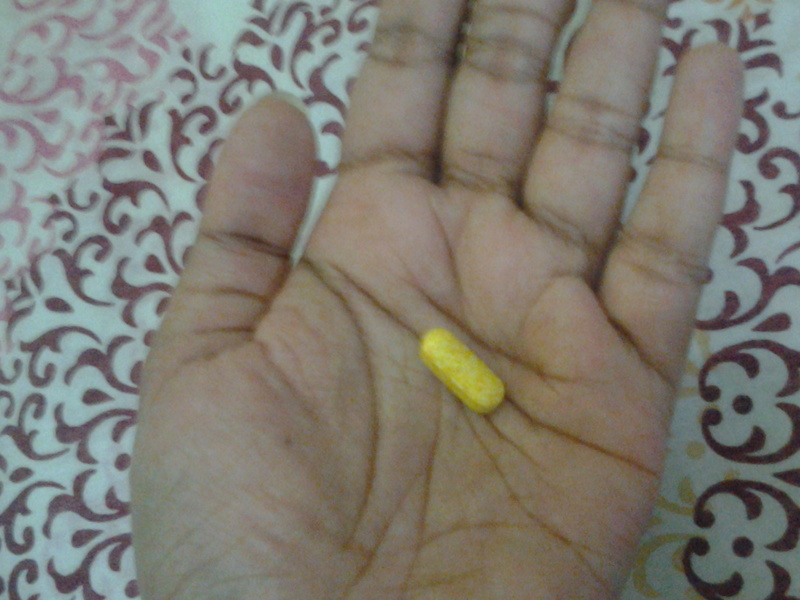 They are pretty large in size and each bottle, costing AED 80, contains 60 tablets, good for 2 months. Within 2 weeks of taking it, I noticed tiny hair sprouting up along the border of my forehead and at the back of my neck. Then it started growing longer over the weeks. The result was very much noticeable in my case. I loved it totally!. Doing haircare DIYs at the same time, really helped along the hair growth I should say. You have to make sure you drink a lot of water too. I mean, if you just have the tablet, do nothing else and wait around for results, it might take a looong time! When those tablets were over, I went back to the pharmacy but unfortunately Nature’s Bounty was out of stock. So I went for another brand. 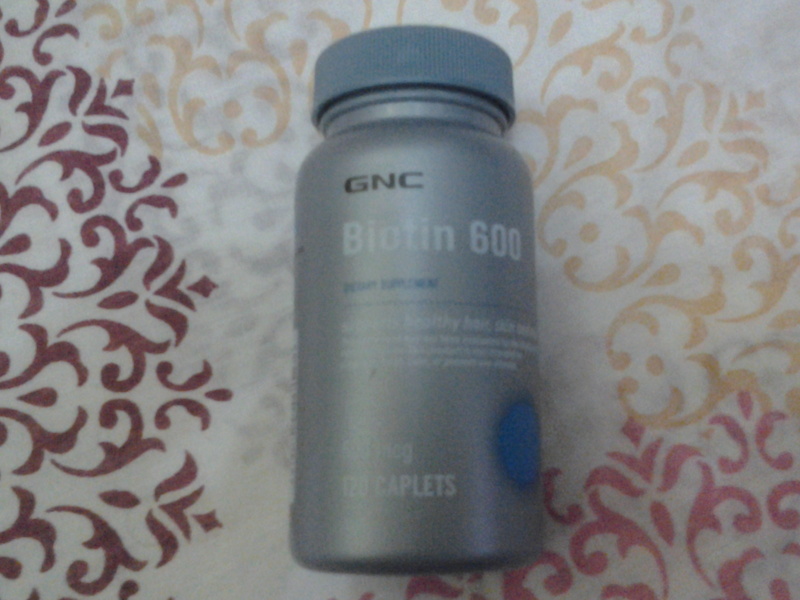 This time, I chose Biotin 600 from GNC. It contains 600mcg of Biotin and no other vitamins. It’s ok. The tablets are small, oval sized white ones, with no smell. Each bottle, costing AED 65, contains 120 tablets, good for 4 months. Once this is over I will go back to Nature’s Bounty, because it gave me the best first impression. I would highly recommend Nature’s Bounty over GNC, as it contains other key vitamins too. Though there are many different levels of Biotin available in the market, I wouldn’t suggest taking more than 5000mcg per day. Our body does not require a LOT of biotin. Moderate amounts like 1000mcg will do the trick. So why take a large amount like say 10000mcg? 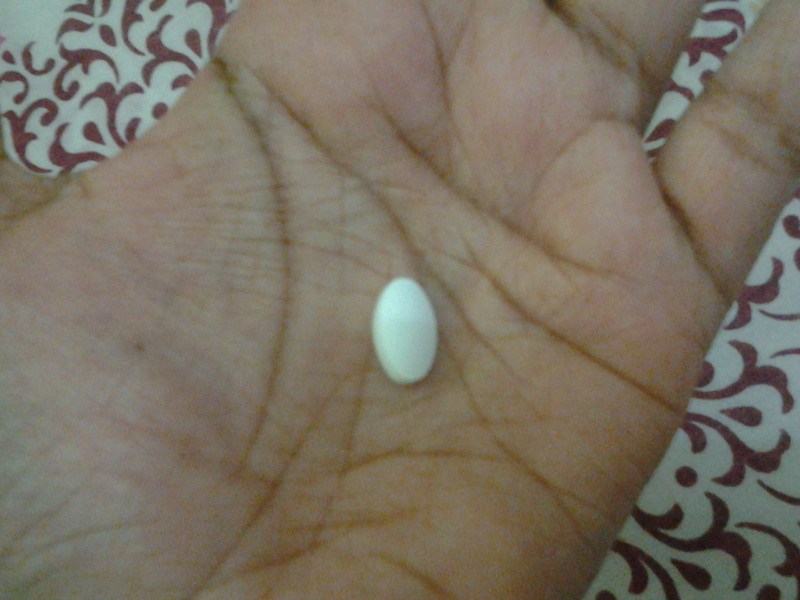 I take these tablets only when I occasionally get mouth ulcer. If you have got mouth ulcer before, you will know how bothersome it is. So if I wake up one not-so-fine day and find an ulcer, I immediately pop one of these tablets and until it’s gone I take it once per day. While we are on that subject, let me tell you that when you get an ulcer and you don’t treat it immediately, there are chances that there will be swelling on that side of the face, along the jawline. Don’t worry. Just take this tablet and the swelling will go down. 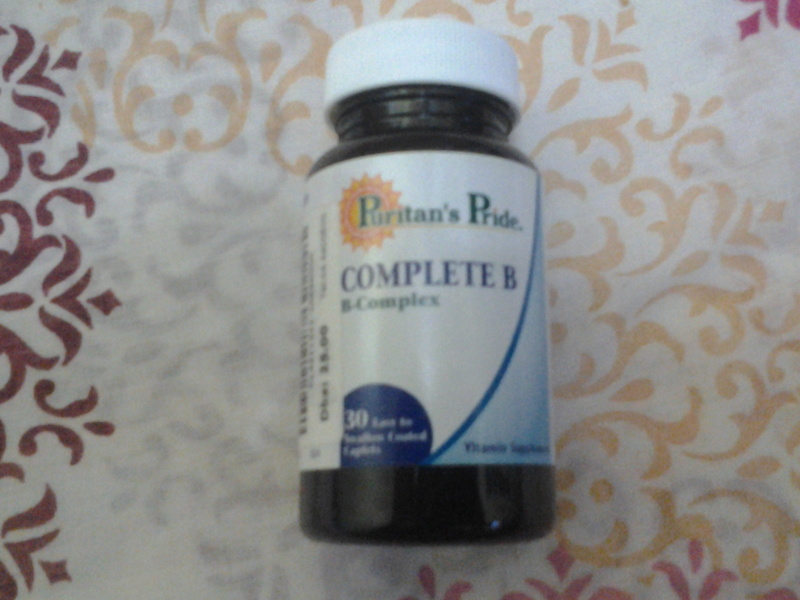 The one that I use is Complete B from Puritan’s Pride. All tablets were purchased from Bin Sina Pharmacy, which has a number of branches all over UAE. So that’s it for now, guys!. Everything mentioned above is based on my experience. You gotta understand that everything works differently for different people :). Do you take any vitamin supplements?. Let me know in the comments..
2 eggs = 1 fabulous DIY hair mask + 1 face mask! My last DIY haircare mask required 5 ingredients. The one I am going to share now, has only 2 ingredients and the result it gives is fantastic when compared to any other masks I have done so far! 2 egg yolks – Our hair is made of proteins and the protein content of the yolk adds strength to the hair follicles, thus making the hair roots stronger. The fatty acids in it brings a natural shine to your hair. It aids in controlling hair loss. I have long hair by the way. So I require 2 egg yolks. 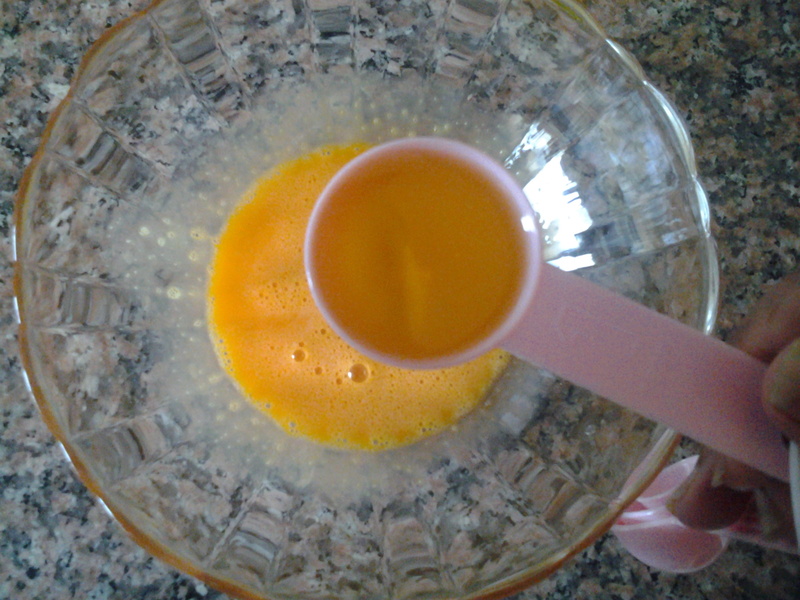 If you have shoulder length hair, I believe you will need only 1 egg yolk. 2 tbsp Extra Virgin Olive oil – Olive oil is helps hydrate and deep condition you hair. 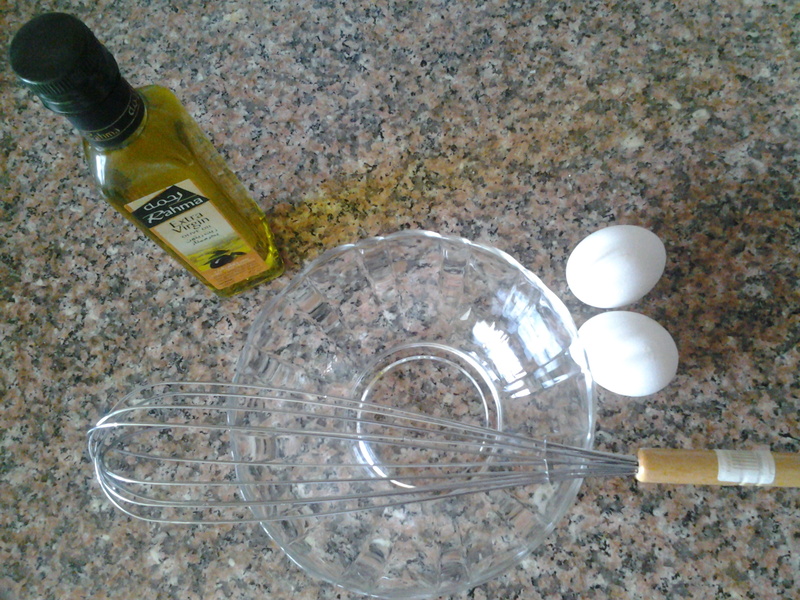 The amount of olive oil depends on the number of yolks you incorporate in the mask. 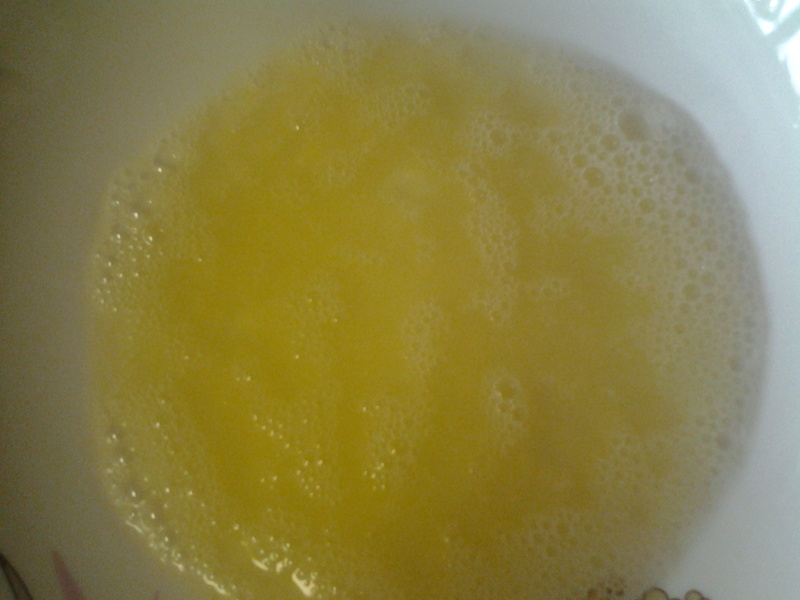 1 egg yolk ~ 1 tbsp olive oil and so on. 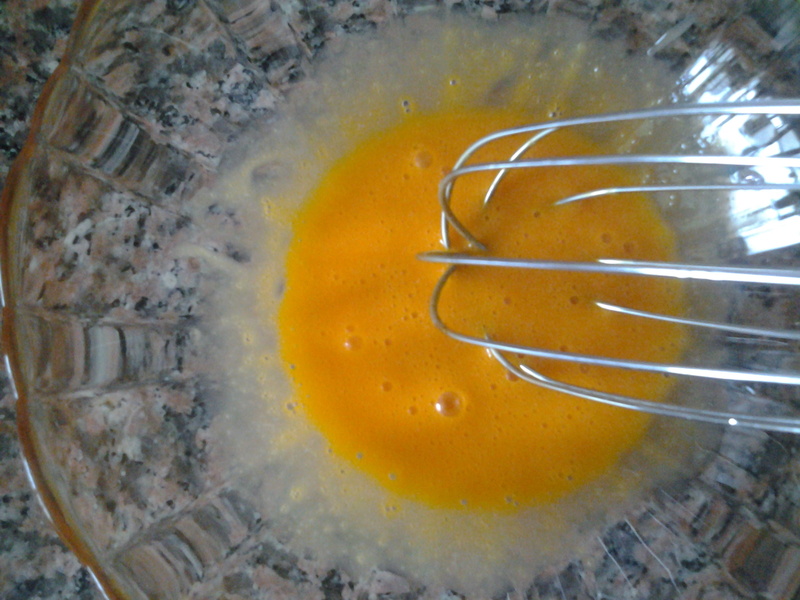 1) Beat the two egg yolks together using either a fork or a whisk, until it becomes a bit frothy like in the photo below. 2) Add two tbsp of extra virgin olive oil to it. 3) Beat the mixture again. 4) Beat it until you get a thick and creamy mixture like below. 1) First wash your hair with a mild shampoo. 3) First apply to the scalp and massage in. Then make sure your entire hair is saturated with this mixture. 4) Pull it up in a loose bun and cover with a shower cap. 6) Wash off with or without a shampoo. I washed really well and I felt the olive oil in it didn’t actually make my hair ‘oily’. So I preferred not to use a shampoo. WARNING: This mask STINKS. Such a horrid smell. But the result it gives is fantastic and I don’t mind tolerating the smell for that!. What is the result you ask?.. SOFT and GLOSSY hair!. You will love how your hair feels. I actually felt like life was injected into my hair. I am loving this mask !!. Look guys, this is a super simple hair mask. The ingredients are easily available. You have NO EXCUSE whatsoever for not doing this. Show your hair some TLC. Come on. Do it! So well, I was left with the egg white, which I beat into a frothy mixture. Initially I thought of making scrambled eggs and eating it. But then I felt like doing a facial with part of it as the batch of my daily anti-oxidant facial had got over. So I simply took about 2 tbsp of the above mixture and applied it onto my face and neck. I kept it on for 10 mins until my skin felt real tight. This mask helps brings glow to your skin. Also it helps shrink the size of the pores on your skin. If you have large pore size, this mask is perfect for you. Gives instant results. Overall, you are left with smooth and soft skin. I suggest this mask once a week. 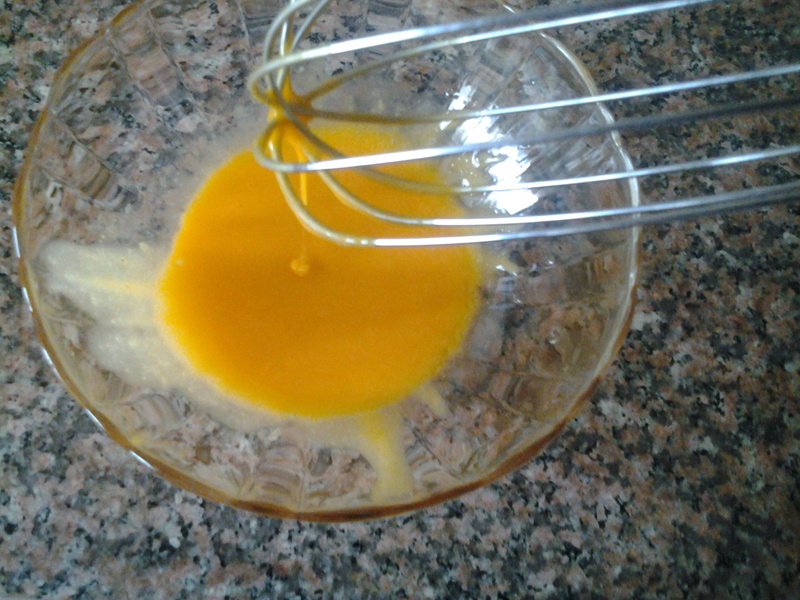 In the picture above, my mixture seems a bit yellow because I managed to get a few drops of the egg yolk in it!. Clumsy me 😛. 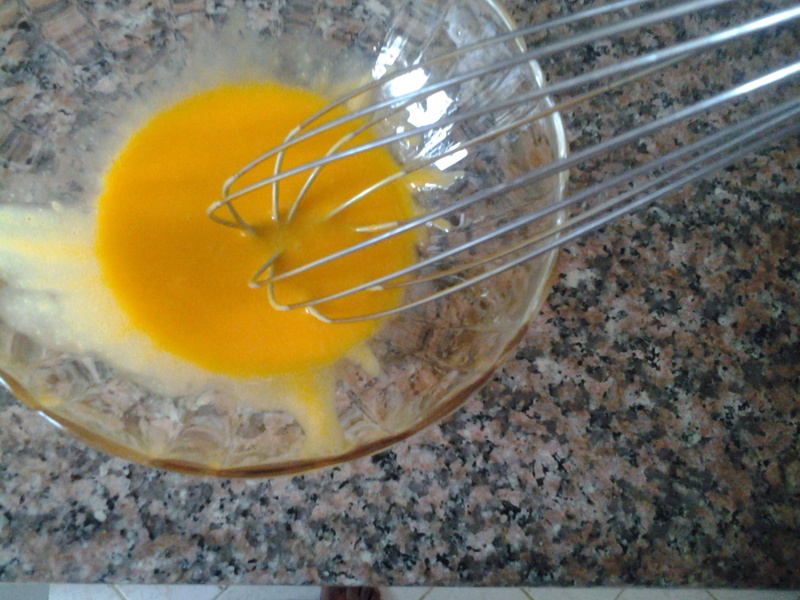 If you have acne prone skin, please make sure that you don’t get egg yolk into this mixture because it might break you out. So that’s it for now. With the rest of the egg white, I made scrambled egg. Hehe. I just now realized that this is my 50th post. How cool!! 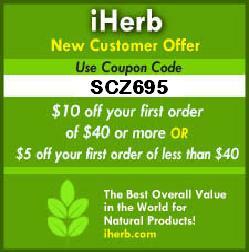 Now that you are here, check out this online site iHerb which ships worldwide. They ship from US to UAE in less than 2 days. Ultimately fast shipping!. They also sell literally everything you need from makeup brushes, cosmetics, natural supplements and even grocery items!. Use the code SCZ695 for a $5 or $10 discount on your first purchase!.